The Garmin Drive 40LM is a car satnav with Lifetime mapping. There are two models available with either UK and Ireland maps or Western European maps. The satnav also includes dual orientation mode with a 4.3-inch screen. Garmin Drive 40 has been discontinued. The Garmin Drive 40LM is a car satnav with FREE lifetime maps. There is a choice of either UK and Ireland or Western European maps. The screen size is 4.3-inches and you can use this Garmin satnav in dual orientation and the device knows when it has been rotated and adjusts to display horizontally or vertically. If you would like traffic information, voice-activated control of your satnav, bluetooth and Full European mapping you should buy a Garmin DriveSmart satnav instead of a Drive satnav. The Garmin Drive 40LM includes everything you need to mount and install it in your car. Included when you purchase from ActiveGPS is a Vehicle Suction Cup Mount which is used to mount the satnav on the windscreen - simple, quick and easy. 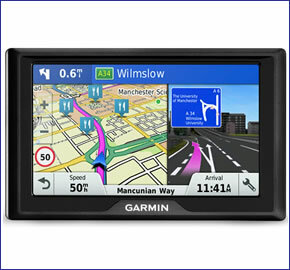 Garmin Drive 40LM is preloaded with City Navigator NT for the UK and Ireland or Western Europe (provided by here maps). Looking for accessories and spares for the Garmin Drive 40LM? Accessories available to purchase include a 4.3-inch carrying case, vehcile power charger, a weighted dashboard mount and a vehicle reversing camera. Along with these accessories, it's also possible to buy replacement parts such as suction cup mount and vehicle charger. The Garmin Drive 40LM are both preloaded with street-level road maps for the UK and Ireland or all of Europe. If however, you want to take the Drive 40LM further afield, we may have the map that you need. Garmin Drive 40LM available maps include: USA, Canada and Mexico, Australia and New Zealand, Morocco and Southern Africa. Do you have a question about the Garmin Drive 40LM? Submit your question via our contact page.